David Casteal plays York, who was a guide to the Lewis and Clark expedition. William Clark's manservant York, one of many people to be recorded in the journals of the Lewis and Clark Expedition, takes center stage in an eponymous one-man show that restores voice and substance to this marginalized historical figure and member of the Corps of Discovery. Born into slavery in the early 1770s, York became Clark's manservant while both were still boys. In 1804, when Clark set out with Meriwether Lewis to lead the cross-country expedition that would become their joint legacy, York remained by his side. He was the only African-American slave among the party; his loyalty, courage and skill proved valuable to his fellow explorers and were even said to have saved lives. 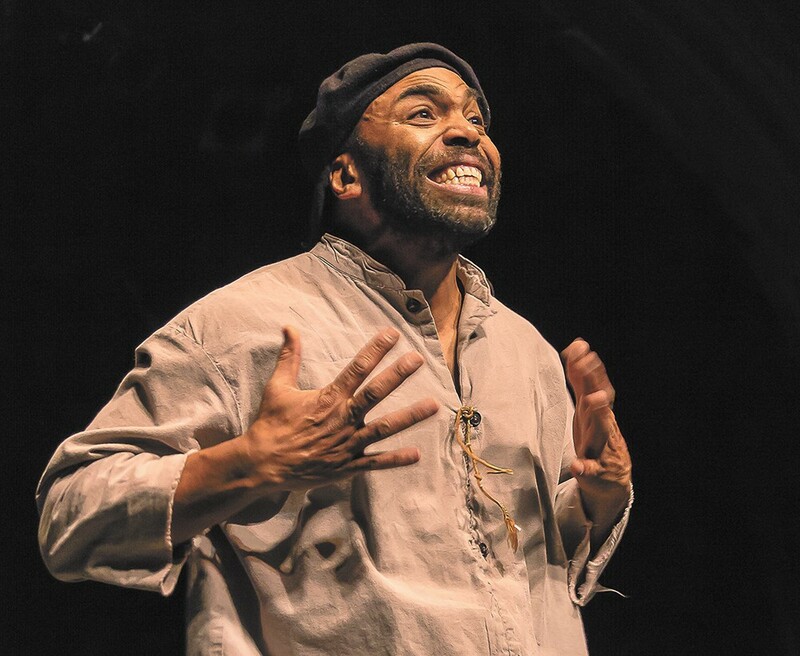 Local playwright Bryan Harnetiaux and actor and African drummer David Casteal spotted a story worth telling in York's adventures — not least because of the self-respect he gained during the expedition and the uncertainty of his fate after his return in 1806. It would take nearly 200 years for York to be recognized as an official member of the Corps of Discovery. York debuted more than 10 years ago to commemorate the bicentennial of the Lewis and Clark Expedition, with Casteal acting in the title role and performing drum rhythms of his own composition. The show was met with a warm reception as it toured the Pacific Northwest and points beyond. "It was quite a journey we took last time around," says director Susan Hardie, who has reunited with Harnetiaux and Casteal to stage a new production of York that makes subtle improvements to the original. So far, the revival of York has already played at The Bing, The Modern Coeur d'Alene, Whitworth University and other area venues ahead of its three-show run at the Civic. "When they brought me back on board, I saw it as a challenge to take the original piece and deconstruct it and make it stronger," Hardie says. "David and I decided the best thing would be to revisit every aspect of the show. As artists, we've grown, and we felt that we could deepen the emotional content." As York traces the life of its subject from the age of 4 until about 40, that offered plenty of "emotional mileposts" to augment. "Not only does York go on a physical journey, he also goes on a really amazing emotional journey," says Hardie. "It seems to me that we've taken those issues that York faces — those issues of freedom versus slavery, how he sees himself, his voice and how he expresses himself, or finding out that his wife has been sold — and raised the emotional stakes for the character. The reason we do this is to move people."